This editorial was published on Health Affairs Blog on March 9, 2018. For nearly two decades, donors, policy makers, and public health practitioners have lauded performance-based financing (PBF) as a solution to strengthen health services and accelerate progress toward reaching global health targets. PBF links health care provider payments to the achievement of predefined indicators associated with better health. For example, a provider could receive a bonus for every child that she or he fully vaccinates. It’s thought that the financial incentive will motivate health workers, drive them to improve service delivery’s effectiveness, and ultimately lead to better health outcomes. Although the global evidence based on PBF’s impacts is mixed, several rigorous impact evaluations have demonstrated statistically significant improvements across targeted indicators. Since gaining traction as a promising health financing approach, PBF proponents have focused on leveraging PBF for broader health system transformation. At present, the PBF community is packaging best practices to propel this change: what governance arrangements make the most sense when managing PBF, which indicators work best to measure progress toward achieving results, and how to best verify reported results. As the energy heightens around crafting the ideal PBF model, it’s time to take a step back to assess the appropriate context for implementing PBF in the first place. Recently, we had the opportunity to rigorously measure the impact of two PBF programs implemented at scale in Mozambique’s Gaza and Nampula provinces. The programs””which aimed to use PBF as a tool to strengthen HIV, prevention of mother-to-child transmission of HIV, and maternal and child health services””had nearly the same design, took place during the same period, and were managed by the same development nongovernmental organization. Despite these structural similarities, their implementation contexts led to uniquely different results. Our impact evaluation showed that in both provinces, PBF’s effects weren’t shown immediately””systems had to first adjust to the new approach. In Nampula, it took 14 months of exposure before indicators (such as complete vaccination) responded to PBF. In Gaza, however, it took 20 months””half a year longer. It wasn’t just the length of adjustment time that differed. Out of the 18 indicators we analyzed, one-third responded to PBF in one region but not the other. For example, in Nampula, there was a 60.5 percent increase in the number of adults co-infected with HIV and tuberculosis who initiated antiretroviral therapy for the first time. However, there was no change in Gaza. Conversely, in Gaza, there was a 45.2 percent increase in the number of HIV+ children 0-23 months of age who initiated antiretroviral therapy treatment for the first time, but in Nampula, there was no change. For indicators that did show improvements in both provinces, most had highly variable magnitudes of change. For example, in Gaza, there was a 221.7 percent increase in the number of HIV+ women who received a family planning consultation and a modern contraceptive method, while there was a 162.6 percent increase in Nampula. Simply put, PBF responded differently in each province, despite the nearly identical program design and implementation. Why did the impact evaluation tell such a different story in each province, despite the nearly synonymous program design and implementation approach? Our qualitative research on PBF’s health systems impacts (forthcoming) suggests that several contextual factors steered the program’s effects and results. These factors include differing baseline service provision rates; divergent subnational approaches to rolling out a national antiretroviral therapy plan; and distinct characteristics of subnational governance, human resources, pharmaceutical management, and quality of care. In short, the provinces’ institutional, geographic, and cultural contexts were major drivers of program effectiveness. In a range of countries where we have worked, donor agencies and implementing partners have taken a cookie-cutter approach to designing PBF programs. A look at the 25 World Bank-supported PBF initiatives show very similar designs across all programs, regardless of their contextual nuances. Critical questions, such as a country’s ability to disburse PBF bonuses on time or whether the country has the capacity to separate politics and patronage from the verification process, are often glossed over. When evaluation results show poor performance, PBF ideologues often dismiss the findings as simply rooted in weak design or implementation practices. Taken together, these factors often constrain a country’s ability to have an honest and assessment-based dialog on whether PBF makes sense in the first place. PBF can have enormous impacts under the right circumstances. We saw this in some services’ strong performance in Mozambique. But instead of racing toward PBF as a silver bullet, funding agencies, policy makers, and implementers should first conduct a contextual assessment that accounts for political, legal, institutional, epidemiological, market, and cultural factors. This assessment should answer why priority services are not performing and whether PBF can really offer a solution. Additionally, funding agencies and policy makers should compare other possible means to improve health system performance to find out whether PBF really is the right fit””or if there is a more relevant approach out there. These considerations should account for the projected costs of implementing PBF vis-Ã -vis alternatives. 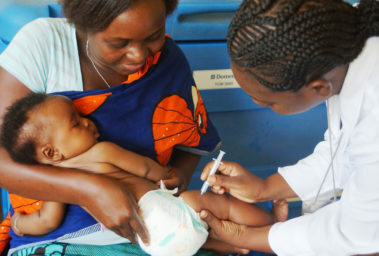 Before launching isolated PBF pilots, policy makers and implementers must evaluate how PBF will synergize with other health financing modalities, such as broader strategic purchasing or input-based budgeting. For programs already underway, their corresponding impact evaluations should go beyond the basic metric of statistical significance to focus on the magnitude of effect and its duration. When assessing whether a financial bonus would actually have an impact, policy makers and implementers must understand what drives health worker performance. At a higher level, PBF proponents must consider the broader political economy of sustaining PBF as a legally legitimate tool. PBF’s evolution is not different from many other global health trends purporting to transform health system performance. Policy tools, such as health financing strategies and fiscal space analyses, are promoted as fundamental to health systems development””even in countries undergoing fiscal crises or with limited political interest in health financing. Previously, community-based health insurance was all the rage””now large-scale strategic purchasing is emerging as the next silver bullet to revitalize health systems. Independent of countries’ values and capacities, foreign assistance providers have, for decades, individually lobbied for their own ideologically driven prescriptions on topics such as user fees, free health care for all, and private health care. Donors, policy makers, and practitioners must shake ideology’s grasp and shift their mindset to temper PBF””and trending strategies like it””with an understanding of the contexts of countries themselves.